Today, 16 years ago at 13:55 my daughter, Nicole, was born! It was such a day of joy, happiness and pure exhilaration! That day I simply couldn’t contain myself. After we left the “delivery” theatre, the nurse wanted to clean Nicole up, but I insisted that no-one but I may give Nicole her first bath. While I was holding that tiny little body in my hands, her head resting softly in my left palm, I couldn’t help but thank God for such a precious gift! Now, 16 years later, I am a proud father of a young girl who is a hard worker at school, and apart from coming second in her grade (9) last year in academics, she also gets awards for displaying the fruit of the Spirit every year. She is indeed a joy! February 1, 1995, was indeed a wonderful day, especially for our family! However, February 1 did not remain such an incredible day for long! Even though, in our family it remains a day of wonder and celebration, a day of infamy dawned on South Africa on February 1, 1997. On this day in 1997, the Bill on the Termination of Pregnancy (TOP) became law. Since then, somewhere between 750,000 and 1,000,000 babies have been brutally murdered! Posted by Unknown at Monday, January 31, 2011 0 comments Email post to a friend! Marie Stopes International (MSI), was started by Marie Stopes, a eugenicist. MSI is involved in the daily slaughter of unborn babies. Taryn Hodgson of Africa Christian Action, wrote an article on Marie Stopes and her evil organization, especially with the commemoration of the legalization of abortion on demand in South Africa on 1 February 1997. Because of this, many people will be involved in protesting the legalization of abortion in South Africa over this time. See the end of Taryn's article below for more information on how you can be involved in these protests! I will be at the protest in Boksburg, so if you decide to join us, please comes over to say "Hi!" I will be the one with the camera! Posted by Unknown at Friday, January 21, 2011 0 comments Email post to a friend! Did 67.8% or 57% of matrics pass in 2010? So, I think it is time the euphoria about South Africa’s miraculous climb in the matric pass-rate to 67.8% (up 7.2%), should be brought back down to earth! Yesterday, I asked the question, Is passing matric an accomplishment at all? Posted by Unknown at Tuesday, January 11, 2011 0 comments Email post to a friend! Is passing matric an accomplishment at all? When one looks at the matric results of 2010, so many questions are raised about the results. While no-one can deny that our educational standard is far below par, except for the ANC and its cronies of all stripes, including Umalusi (the quality assurance body for education in South Africa), we have to wonder why there is such a huge jump (7.2%) in our matric pass-rate?! Carien Kruger and Gershwin Chuenyane probed this issue with some questions in their News24 news article. 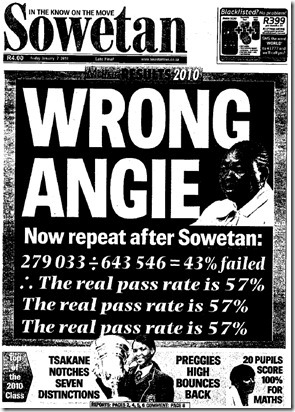 Basic Education Minister Angie Motshekga called the 67.8% pass-rate a “remarkable achievement.” When someone, like an education minister calls the failure of 32.2% of matric pupils a “remarkable achievement,” it has to be recognized that the education department’s priorities are all messed up. When a third of a school’s individual class fails in matric, it would be recognized as a disaster, and an investigation should be launched as to why so many children have failed in that class! Yet, when a third of our country’s matrics fail, it is called a “remarkable achievement!” How pathetic of our education department to think that this is remarkable! Posted by Unknown at Monday, January 10, 2011 0 comments Email post to a friend! U.S. President, Barack Hussein Obama, claims to be a Christian, and has made several comments about his faith. However, when it comes to abortion (which I believe is absolutely anti-Christian), Obama has a putrid pro-abortion record behind his name. The stench of abortion hangs on Obama like that of a rotting corpse! Obama’s pro-abortion record since being elected as U.S. president on 4 November 2008 reads like a horror novel. The difference is that this is real life! This is like the Texas Chainsaw Massacre by presidential fiat. While I am reticent to simply say Obama is not a Christian, let the fruit speak for itself! 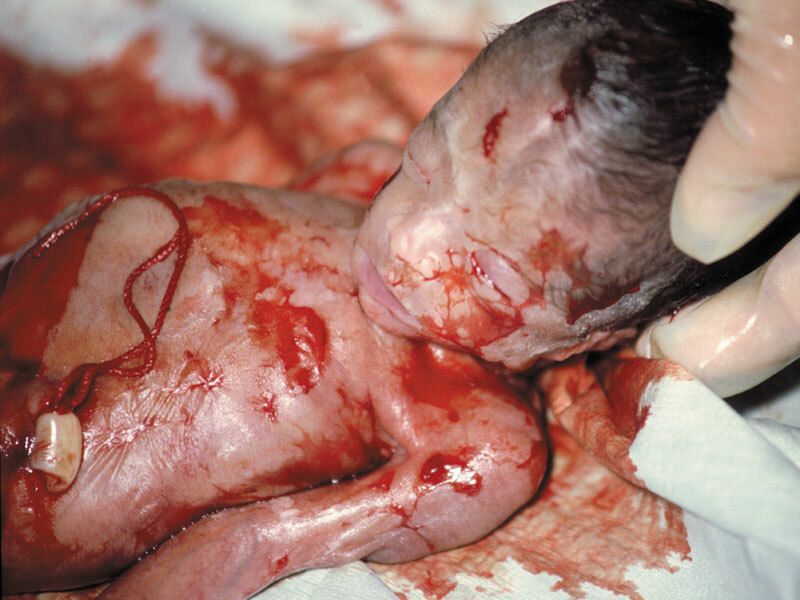 To read more about this evil, child murdering president’s track record on infanticide, read President Barack Obama’s Pro-Abortion Record: A Pro-Life Compilation at LifeNews.com. Posted by Unknown at Tuesday, January 04, 2011 0 comments Email post to a friend! So, what are the top 10 posts? Why don’t you visit the top 10 posts and wonder why they made it onto this list! I also wonder about some of these!